The Pacific region is a kaleidoscopic marvel of coral reef, tropical rainforest and open ocean species. The WWF, or World Wide Fund for Nature, is one of the largest conservation organizations in the world, with more than 100 offices in over 80 countries scattered around the globe. Founded in 1961, we are also one of the oldest and most respected environmental organizations. WWF has been present in the South Pacific since 1995 working to protect the region’s exceptionally rich marine biodiversity, which is threatened by human activity. Our work is conducted in the Solomon Islands, Papua New Guinea and Fiji. We have offices in Madang, Papua New Guinea, Ghizo in the Solomon Islands and Suva in Fiji. Our mission is to ensure that the richness and resilience of our Pacific island ecosystems are managed and conserved in harmony with the aspirations and sustainable development needs of our people. The Pacific Islands are a priority for WWF because they are one of the world’s most pristine natural environments, home to six of the seven species of marine turtle, whales, sharks and a magnificent array of reef fish species, including the endangered humphead wrasse. Many of these species are dependent on the Great Sea Reef, which sits off the coast of Vanua Levu in Fiji. WWF Pacific’s long-term goal is for there to be supportive legislation and policies that protect the customary cultural and heritage rights of Pacific islands people, ensure the environment is managed in a sustainable manner, and promote the socio-economic development of the South Pacific’s island communities. The Pacific region is home to 30,000 islands, which are part of 22 nations spread over 80 million km2 of ocean. About 80% of Fiji's population lives on the coast. Just 3% of the area of Fiji is land. 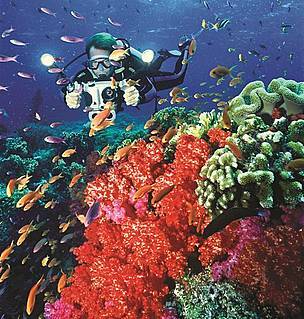 Fiji is home to the Great Sea Reef, the third longest barrier reef in the Southern Hemisphere. Pacific Island nations account for emitting less than 1% of greenhouse gases but are among the most vulnerable to the adverse impacts of climate change, especially sea level rise.